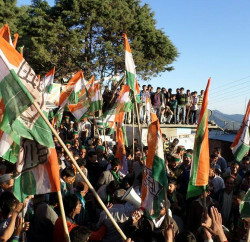 Tug of war between Congress and BJP looking to intensify further as BJP state general secretary Vipin Parmar and spokesperson Himanshu Mishra have criticised the statements of Vidya Stokes and Sujjan Singh Pathania, in which they had accused former Chief Minister Prem Kumar Dhumal for allotting land to the HPCA in violation of rules. In their joint statement BJP leaders accused Congress for targeting the HPCA to “divert the attention of the common people from its failure. They said HPCA president and BJP MP from Hamirpur Anurag Thakur had done a commendable job by bringing an international-level cricket stadium at Dharamsala. The Congress was trying to capture the stadium, they alleged. Earlier, Congress leader and cabinet ministers Vidya Stokes and Sujan Singh Pathania has asked Dhumal to explain the “public interest” behind making the HPCA a company from a society and raising an association by the name of Himalayan Players Cricket Association and registering it in Kanpur and Chief Minister Virbhadra Singh has accused Prem Kumar Dhumal and his parliamentarian son Anurag Thakur for using power for vested interests. However, replying to the Virbhadra Singh’s allegation, former CM and leader of opposition Prem Kumar Dhumal has accused Singh for falsely implicating political opponent and has become “Investigator, Prosecutor and the Judge”.